Radial-Basis Function Neural Networks (RBFN) are a well known formulation to solve classification problems. In this approach, a feedforward neural network is built, with one input layer, one hidden layer and one output layer. The processing is performed in the hidden and output layers. To adjust the network for any given problem, certain parameters have to be set. The parameters are: the centers of the radial functions associated to the hidden layer and the weights of the connections to the output layer. Most of the methods either require a lot of experimentation or may demand a lot of computational time. 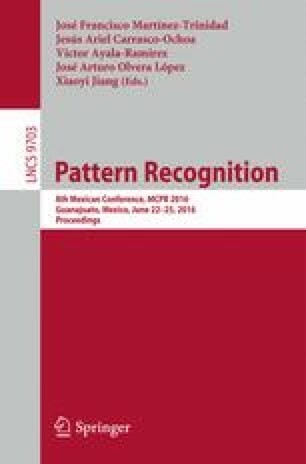 In this paper we present a novel method based on a partition algorithm to automatically compute the amount and location of the centers of the radial-basis functions. Our results, obtained by running it in seven public databases, are comparable and even better than some other approaches. The authors thank Tecnológico de Monterrey, Campus Guadalajara, as well as IPN-CIC under project SIP 20161126, and CONACYT under project 155014 and 65 within the framework of call: Frontiers of Science 2015 for the economical support to carry out this research.